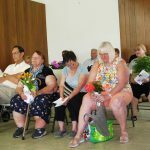 West Side Detroit Polish American Historical Society Celebrates Assumption At Holy Cross Cemetery & Revives An Old Custom Of Blessing Herbs And Other Garden Items On Saturday, August 15, 2015. 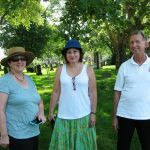 It was a very hot summer day, but the sun was shining brightly and we had a good turnout for our first summer event to be held at Holy Cross Cemetery! We decided to do something different this year since we take pilgrimages to west side cemeteries in the fall every year, and while we have been blessed with sunny weather so far-or at least there has been no rain or snow-it’s generally too cold and windy in the fall to take sufficient time to visit loved ones’ graves. It was a perfect opportunity to go to Holy Cross on Saturday, August 15, which was the Feast of the Assumption of the Blessed Virgin Mary, the Catholic Holy Day celebrating Mary’s assumption into heaven. On this day Catholics celebrate an ancient tradition of having the priest bless fresh cut herbs, flowers, garden vegetables, fruit, and vegetables, so we tied this tradition in with our event. 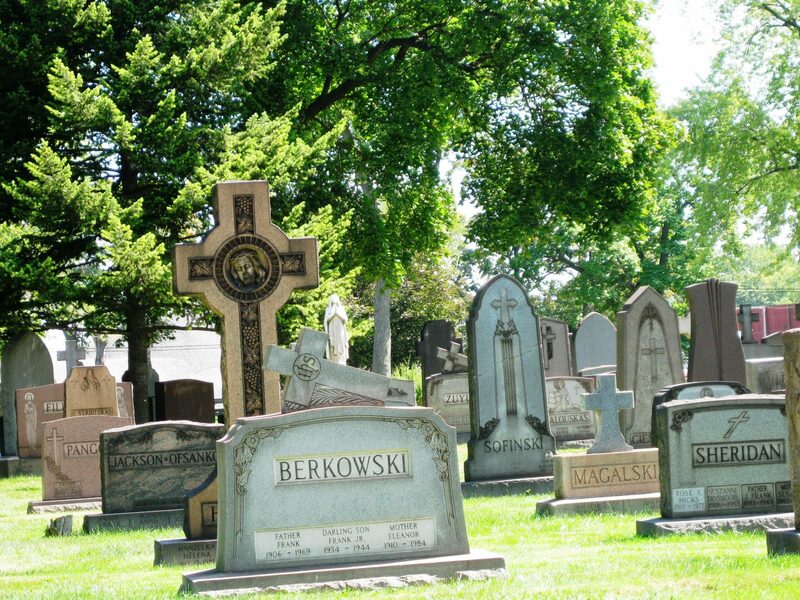 We offered attendees the opportunity to send us in advance the names of their loved ones who are buried at Holy Cross so that we could have their graves located and flagged. Our Society President, Rev. Gary Michalik, was a presenter and also blessed the garden items. Tom “the Gravedigger” Wozniak came to Holy Cross for us for the second time and gave a presentation. 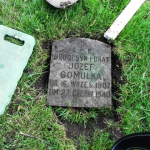 In addition, he spent hours in advance of the event not only searching for the graves and flagging them, but also digging up the markers and resetting them. Many of the markers had sunk and were buried by decades of dirt and grass. This was a huge job that required a tremendous amount of hard manual labor. We started out at 10:30 a.m. in the chapel and Tom began with a presentation on the Organization of Cemeteries, providing all of us with information that we never knew. 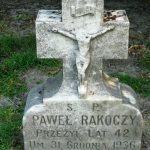 His presentation started out with the history of cemeteries, cemeteries in Europe in the Middle Ages, the influence of the Catholic Church, the pecking order in cemeteries, and suicides. 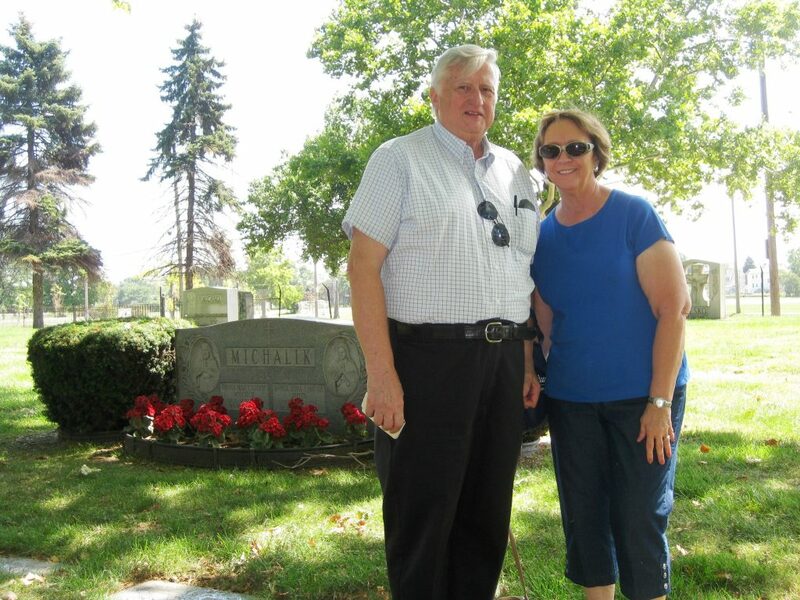 Tom explained that traditionally, the most esteemed place in a cemetery was the eastern section. People of higher classes were buried there so that they would be the first ones to see the sun rise on Judgment Day. The northern section was known as the “Devil’s Domain.” Paupers, unbaptized babies, and suicides were buried there. 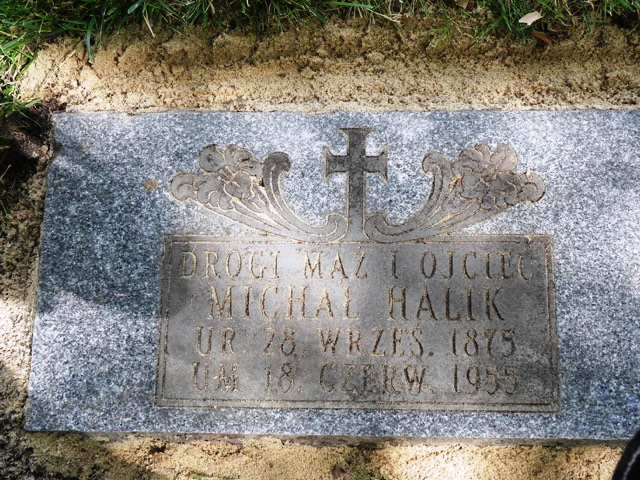 Those who committed suicide were not permitted to pass through the cemetery gates but instead, their caskets were placed over the cemetery walls. Ordinary people were buried in the western and southern sections. 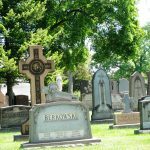 This distinction is clearly visible at Holy Cross cemetery in the grave markers. 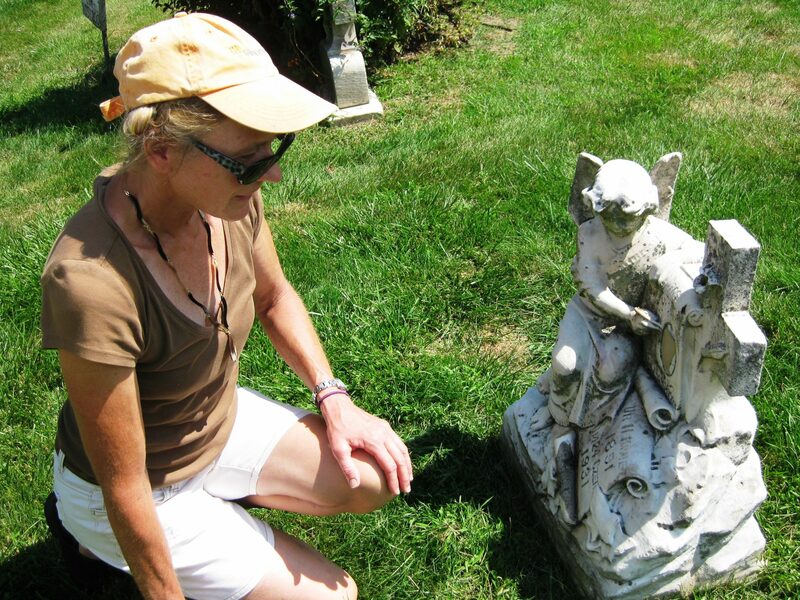 In Holy Cross Cemetery, the suicides are buried in sections K and N. In the past, the act of suicide being committed as one’s final act was viewed negatively. 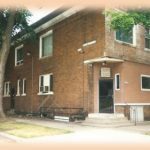 The Church has changed its position to a more sympathetic and compassionate view in the belief that someone committing such an act must be in deep pain. The Church cannot know the person’s relationship with God and does not judge but merely places trust in God’s mercy and love. Tom continued his presentation with Europe in the mid-1750s; modern Europe; cemetery development in the USA; America’s first parks; cemetery design; progression and our view of death; how to find graves; organization into sections, lots, and graves; size of graves; tools of the trade; what a cemetery can provide you; maps, burial cards, and surrounding grave markers; and footstones vs. headstones vs. pins. Before the event, Tom had gone to the cemetery and located all of the graves for us and while he was there he took photos of the graves. 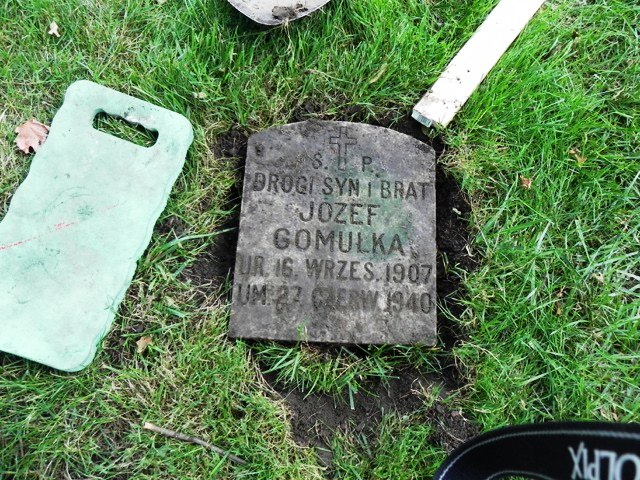 His photos documented his process of digging up the grave markers, filling in the area beneath them with sand to keep them elevated and to provide support to their foundations and also to deter the growth of weeds, and clipping away the excess grass around them. At this point in his presentation he distributed the photos of the grave markers to those present. 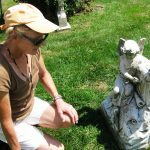 It was a poignant moment for many of us who had never seen the grave markers of loved ones. As an added bonus Tom provided each of those present with the official cemetery record card for their loved one that detailed the date and cause of death. Many of us never knew what our loved ones died of, so it was literally like unearthing the past and was very emotional. It was almost like coming into contact with our loved ones for the first time with new eyes and a renewed understanding. Fr. 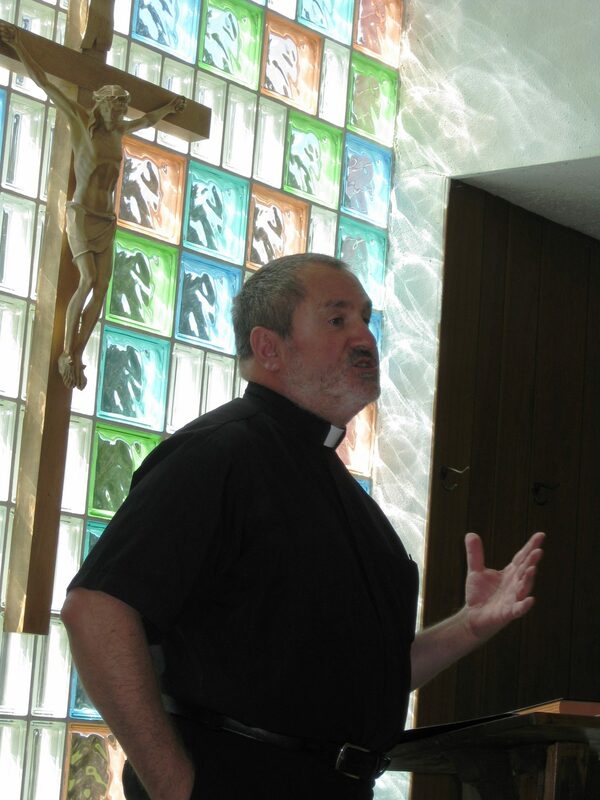 Gary then gave an in-depth and very interesting presentation on the Feast of the Assumption and the blessing of herbs, fresh flowers, garden vegetables, fruit, and vegetables that traditionally has accompanied this day. First he explained that Assumption is the doctrine that teaches that when Mary, the mother of Jesus, died, she was resurrected, glorified, and taken bodily to heaven. The word “assumption” is derived from a Latin word meaning “to take up.” So Catholics celebrate the day when the Virgin Mary was assumed into heaven. Fr. 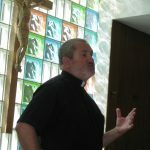 Gary explained further that there are no physical relics existing of Mary, just as there are no physical relics of Jesus. He explained that in addition to the Sacrament of the Eucharist and the other sacraments, the Catholic Church is full of symbolism and devotions, such as praying the rosary. Similar to our taking the Easter basket to church on Easter Saturday for blessing by the priest, we have a ritual in the Church of having symbols of Mary-live herbs, flowers, and other living fruits of the earth-blessed by the priest on Assumption. The contents of the Easter basket are full of symbolism. Each item carries a significant springtime or religious connotation. Similarly, the flowers and herbs are symbolic of the life that Mary gave-the life of the world. These items are then taken home to be enjoyed in our homes or eaten. In Poland, the Feast of the Assumption is also called Matka Boska Zielna (Blessed Mother of the Herbs, or Our Lady of the Herbs). The Blessed Mother is seen as the patron and keeper of the earth and all of its abundance. On this special feast day, every village housewife brought a bouquet of herbs, flowers and grain that was collected from her own garden, the fields and orchards. She gathered dill, mint, rosemary, southernwood, parsley, hyssop, lovage, and comfrey-whatever she had growing in her garden. Many plants were named after the Blessed Mother. For instance, mullein, called dziewanna in Polish, was known as the braids of the Blessed Mother. And the wild herb St. John’s Wort was called the Bells of the Blessed Virgin. Since this time coincided with the time of the harvest, it was also the custom to take a few spikes of various grains including wheat, rye and oats. After the blessing, the flowers and herbs were taken home and tucked behind holy pictures to protect the home against fire and lightning. Some farmers crumbled some of the blessed flowers into their seed bags in the belief that it would assure a good harvest. Some of the herbs were used in folk medicine to cure a cough or a cold. 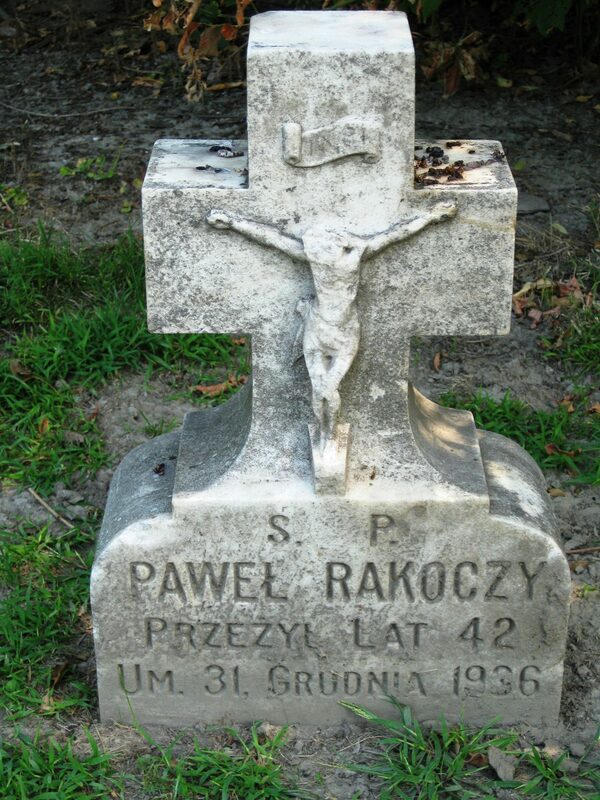 This is a custom that was once prevalent throughout Polonia, brought to this country by our Polish ancestors. In recent years this beautiful custom has slowly gone by the wayside, but we revived it on August 15 at Holy Cross Cemetery. In keeping with tradition, Fr. 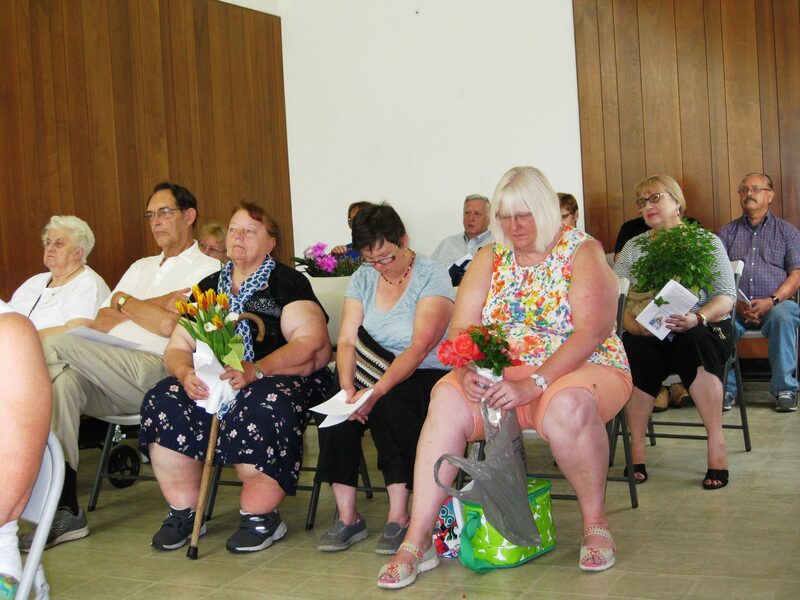 Gary blessed the herbs and bouquets of fresh cut flowers that the attendees brought to the chapel. They then carried them to the graves of their loved ones. 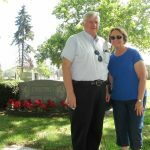 Society member and Polish Genealogical Society of Michigan President Valerie Koselka was with us to help lead the procession to the graves. Valerie also helped with promotion of our event, for which we were very grateful. We were also joined by WSDPAHS member Jerry Pikulinski, who was in town for a conference all the way from Arlington, Texas, and was able to join us for the event. We proceeded to the grave sites. 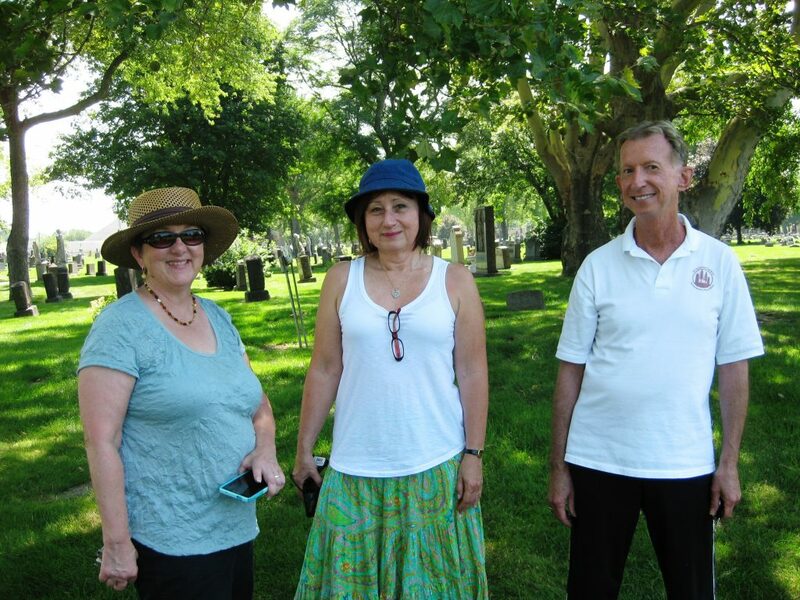 Some attendees went directly to their family members’ graves, to which Tom directed them. Others visited the suicide and the war veterans’ sections of the cemetery before going to visit their loved ones’ graves. 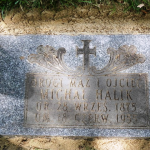 It was hoped that we would have a picnic across the street in Patton Park afterwards, but everyone was so preoccupied with the grave visits that it never materialized. It may be something to look forward to next year. We’re very grateful to our President, Fr. Gary, and to Tom Wozniak and Valerie Koselka, and also to Society Director Richard Sokolowski for providing bottled water for us at this event. It proved to be a very popular event-one that may just turn into an annual outing!